The principal research of Generex Biotechnology (OTCQB:GNBT) for years has been its buccal delivery system. The buccal tissue is the tissue on the inside of the cheek and under the tongue. Generex buccal delivery sprays a solution under a high gas aerosol formulation containing a drug on to the blood-rich tissue inside the cheek and under the tongue. The solution does not go into the lungs. In 2011, Generex completed the Phase III trial of its buccal delivery of insulin. The trial was neither positive nor negative, but the FDA wanted more trials (see more under interview with James Anderson). The company was tapped out on money, and the company and the stock went into coma. There was little activity, and in 2015, the entire workforce was officially laid off. Generex’s stock drifted down, and it ended with a final 1-for-1,000 reverse stock split, at which point it found itself at the bottom of the Mariana Trench, a place called the Challenger Deep, and there it sat with thousands of pounds of atmospheric pressure on top of it, by which I mean a ton of negative sentiment. This is a hard thing to overcome, and we will address this again at the end of this article. When the stock finally reached bottom, the stock was within about $2 million of disappearing. It is a place so low that it is just a graveyard of whale bones lying on top of the ocean silt. Usually, when stocks reach such a low level, they disappear. Generex did not disappear thanks to the efforts of Joseph Moscato and his day-by-day efforts to formulate a solid management team, and by the scientists who wanted to see their technologies through to realization. Mr. Moscato has over 30 years of experience in healthcare, sales and marketing, distribution management, and finance. Mr. Moscato brings his marketing and advertising acumen to drug discovery and diagnostic & treatment development and commercialization. Since 2009, Mr. Moscato has been working as an exclusive consultant to the Company. He has advised on equity financings totaling over $300 million, and has implemented the broad strategic vision for the Company. Mr. Moscato has worked and consulted for Pfizer in several capacities from sales and marketing to new drug discovery & development. He has worked with other biopharmaceutical companies such as GlaxoSmithKline, Johnson & Johnson, Parke-Davis, Amgen and others. Mr. Moscato has consulted for several healthcare focused private equity, hedge funds and family offices. Mr. Moscato also owned several advertising and marketing agencies focused on media, entertainment, and healthcare with clients ranging from Motorola, Chadmoore Wireless, Nextel, Cannon, Sharp, GlaxoSmithKline, Pfizer, and other biopharmaceutical companies. He comes from marketing side, with experience in financing, a good match for Generex, which was basically without this kind of talent. Previous management lacked these kinds of skill sets and connections and was not able to bring its important insulin delivery trial to a successful conclusion. Joseph Moscato’s focus is broader than the Generex he took over, which was essentially a small biotech research firm. As I have said, he comes from the marketing side of things. He has developed financial connections that would only be available to Generex through him. And as was revealed in the January 2018 conference call, he has already looked at over 100 firms for acquisition. 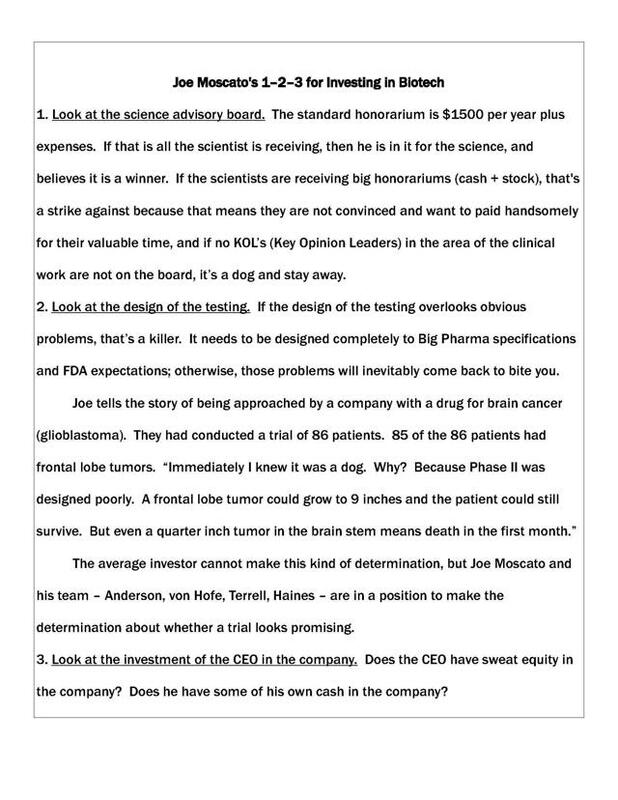 Joe’s thought was that if firms with existing income could be combined with Generex’s promising technologies, Generex would not have to keep looking for funds to finish the research. Those deals just become more and more onerous and hellish for shareholders. So, the idea arose to create a holding company to organize the new acquisitions with the existing businesses, hence a new name for the firm, NuGenerex Biotechnology Holdings, Inc., and a new mission: direct-to-patient, end-to-end healthcare solutions for patients, healthcare professionals, and payors. But let’s give a look at the company’s research. This is the year that the Nobel committee gave the Medicine award to researchers in cancer vaccines. It is the year of checkpoint inhibitors. The problem is that cancer cells disguise themselves as the body’s own cells. And the killer T-cells will not attack cells it recognizes as those of the body. Checkpoint inhibitors are what prevent T-cells from attacking “self” cells. James T. Allison studied one of them, called CTLA-4, which is one of the checkpoint proteins that brake T-cells. And Tasuku Honjo discovered another checkpoint inhibitor, PD-1. And if the brakes are put on both checkpoint inhibitors, even better results can be obtained. It turns out this is exactly where the Generex subsidiary, Antigen Express, and its primary researcher, Eric von Hofe, have been working on lo these many years. It has done studies both against on breast cancer and prostate cancer with success. These are studies in which patients have been treated to the point where no cancer can be detected; the vaccine is given to prevent recurrence. The breast cancer study was done against triple negative cancer, the worst. Merck (MRK), having some luck with its Keytruda, a checkpoint inhibitor, looked around for drugs that it might use in a combination attack. It found the Antigen Express study on triple negative breast cancer and decided in July of 2017 to partner on a Phase II study. The stock market took this news in stride. That is to say, it reacted not at all. The stock market took this news in stride. That is to say, again it reacted not at all. The happy thing that has occurred since the company’s last visit to the FDA is that the formula for its insulin aerosol has been strengthened so that what took 6 to 20 sprays can now be accomplished with 2 to 5 sprays. Users will have to test themselves to see how many sprays inside the cheek they will need, but they will be able to save themselves from the needle, even if advertisers try to camouflage the pain by calling the needle a pen. But insulin may not be the only drug that can use this buccal delivery system. As the CEO Joseph Moscato told me, it will depend on the size of the molecule and the taste. He reported that it was tried with opium-based painkillers, but the users found the taste so abhorrent that they would rather take it with a needle. But for those situations where it works, Big Pharma may be able to extend the life of their patents, which could be another boon for Generex. So, the company expects to be finding applications for its buccal drug delivery system for years to come. With the acquisition of the medical services organization (MSO) of Veneto Holdings LLC (“Veneto Group”), Generex continues the effort to diversify and locate revenue and income producing properties begun in January. The Veneto Group will be folded into the recent created subsidiary, NuGenerex Distribution Solutions, Inc. Veneto is headquartered in Dallas, with offices in Texas, Oklahoma and Arizona. A lot of its business comes from a specialized pharmacy, but the business provides comprehensive support for doctors including – testing, lab work, scanning, insurance adjudication, strategic planning, marketing, accounting, and legal and regulatory guidance. The plan is to take the company from the current 5 states to 27 states around the country. Generex suddenly becomes a company with more than 100 employees and sales in the tens of millions. Since Generex bought the meaningful assets, no audits are needed, other than going forward because Veneto has completed three years of audits. The company was started in 2014, so growth has been exceptional. What seems to be obvious is that the announcement of the acquisition of a company with significant sales is what has activated the stock. The company acquired Hema Diagnostics in 2017, renamed NuGenerex Diagnostics, Inc., which has in the pipelines point-of-care diagnostic tests for syphilis, tuberculosis, HIV, and sepsis. Sadly, syphilis, which had been pretty much knocked down, is now in a worldwide resurgence. Sepsis is a very tricky thing to diagnose since it is an immune response, a syndrome, and not necessarily caused by a particular bacteria or virus. The tests are cleverly designed to be inexpensive with relatively easy to use test strips, and management is paying attention to the matter of how it will be paid. Joe felt I was devoting too much time on him, and so he provided with contact information on other members of the team. He spent fifteen years at FedEx, starting at 17 years old in Memphis when the firm had less than 100 employees, before any IPO, in a company everyone today knows changed the way the world did business. This early bird was there for the explosive growth, and that led to good jobs in Chicago, Boston, and Memphis where he led some of the largest mission critical day-in-and-day-out operations in the industry. He is keen on the Veneto acquisition because with his Medco experience he is comfortable in the pharmacy area. Veneto is focused on alternative pre- and post-operative pain management in the face of an opioid epidemic. It is a timely business to be in. Inventory is not large, “only 30 to 40 SKUs, and there will be many turns.” Meaning: the inventory will turnover rapidly. “Physicians and patients are operating with a lower risk of addiction by limiting opioid days’ supply and providing alternative therapies to relieve pain. The model is compliant with all laws and regulatory issues, and I had not seen a private company to this date that had spent so much on its legal opinions and compliance programs.” They are only operating in five states now, but he is gearing up for a national footprint with internal growth, acquisitions and sales initiatives all in the mix. Jason Terrell met Joe Moscato on a road show for a small biotech start up over six years ago. “Joe was the only one I spoke with who told me the truth – that we would never get funding the way we were going about it. I greatly appreciated his honest, direct approach and we got along really well. So, I kept in touch with Joe, and he would run this idea by me and that idea.” Moscato needed a medical sciences expert to bounce off of when he came across new technologies. Jason and Joe have looked over 200 different companies (or technologies). And they have some in mind to pursue, if circumstances permit. So, if acquisitions happen, and note recent acquisitions at the end of this piece, it should be no surprise to anyone. But like all scientists, he will not say anything absolutely, positively definitive; he’s waiting for the data like everyone else. Though he does feel the team at Generex is 100% world class. What’s that? “American Society of Clinical Oncology.” When I looked Lyman up, I found that he had chaired the Guideline Methodology Committee, which harkens back to point #2 of Joe Moscato’s 1-2-3. So, if a top notch team counts for anything, Generex has it. It is hardly surprising that he was a founding editorial board member of two journals for diabetes and serves as a reviewer for 5 other diabetes or endocrine journals. He said his first exposure to Generex was in 1984. “I went to New Haven with Bruce Frank, who was the best insulin chemist in the world, also at Lilly. We were intrigued by buccal delivery. At that time, only a little insulin got into the blood stream, but it was something.” So he kept tabs on the technology and Generex. Later, he set Generex up with Eli Lilly (NYSE:LLY) in the early 2000s for a study, but then left for Japan for three years to complete work on human analogs of insulin. When he came back from Japan, the deal with Lilly had been terminated. 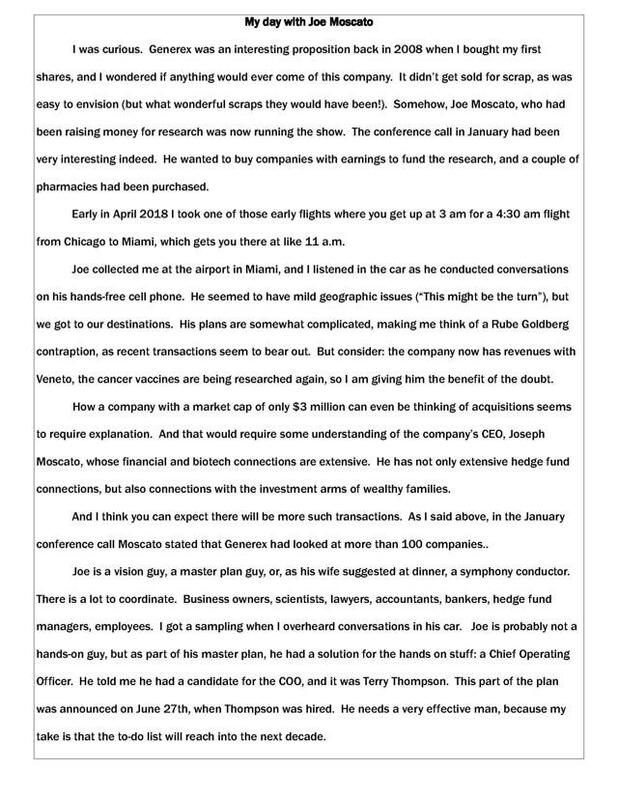 He was drawn back to Generex years later by Joe Moscato who met him at an ADA Conference. Afterwards, he had called Anderson to see if he would be interested in working with Generex, he passed the lead over to Mark Fletcher, who had taken the reins from the founders, and Anderson came back to work on buccal delivery. Anderson said one of the concerns with Pfizer’s (NYSE:PFE) Exubera was that it went into the lung where it was difficult to see if tumors were developing. Although there have been no tumors with Ora-lyn, an advantage of Generex’s Ora-lyn is that it is easy to inspect the inside of the mouth for problems, and it can’t go in the lungs. We discussed the problems of the trials of Ora-lyn that led the FDA to require more testing. He reported that testing was done in the European Union, and there were language problems, incomplete surveys by patients, a weak drug that still required as many as 20 puffs, and it was not a well-designed study, which failed to meet statistical requirements. And that was what led to the FDA requiring more testing. Since that FDA review, studies in Toronto had shown that the number of puffs can be reduced to 2 to 5, and that in dog studies, it appeared that the insulin was getting into the blood stream. He reminded me that the main product was not insulin, but a delivery system that could be used with other drugs. A timely possibility he noted would be the use of the delivery system with cannabis oils, which may have neurological possibilities – pain reduction. I said that I felt that Big Pharma was missing an opportunity by not funding studies, he agreed, and suggested it might take another safety study with the new concentrated formula to entice them. Anderson brightened up at the thought that the current leadership under Joe Moscato might be able to find the money to do that study. Eric von Hofe has spent his whole career in cancer oncology, potentially a depressing area to be in. While he was an Assistant Professor at the University of Massachusetts Medical School, “I became acquainted with Bob Humphreys, who also did a post-doc at Harvard, who was making key discoveries.” Eric then moved on to biotech, first at an antisense company in Worcester and then moving on to Millennium Pharmaceuticals. Meanwhile, Humphreys was continuing to get by with SBIR (Small Business Innovation Research) grants, and making progress. Eric consulted with him for a while in 1999, and kept in email contact. Eventually, Humphreys went on to start Antigen Express, and Eric joined Humphreys. 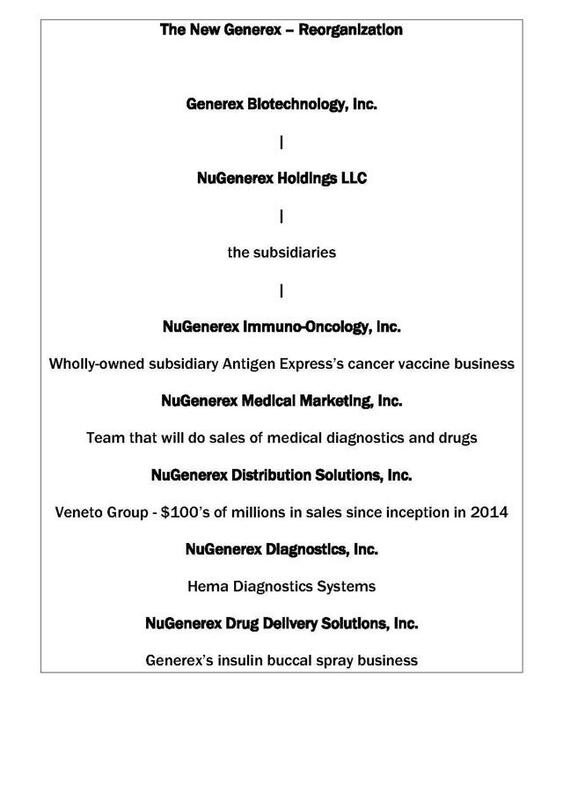 In 2003, Antigen Express was bought out by Generex. Eric informed me that Merck with its Keytruda drug had made progress with checkpoint inhibitors, which stop the immune system from going after the body’s own cells. If you can get past the checkpoints, then you can kill the cancer cells, which employ a human disguise. He said, “It’s a blunt tool. Merck noticed that it only worked in about 25% or 30% of patients, so they started looking around for other drugs that could work with it.” Merck culled the studies, and found that Antigen Express had had some luck in triple negative breast cancer. AE37 vaccine stimulates the immune system to recognize a protein expressed on cancer cells (HER2); more importantly, the immune system can recognize this protein at lower levels than even the very successful drug Herceptin, which targets the same protein. And a key advantage of AE37 is that it is practically non-toxic. And this was the basis for the partnership with Merck. It was similar story with Shenzhen and the trial for prostate cancer. Antigen Express had done a Phase I study on prostate cancer that looked promising. As Jason Terrell explained above, a lot of the work in the immune space has been in the CAR T cell area, where T cells are taken from the patient’s body and tinkered with. Then they grow a lot of them, and then re-introduce them into the body. Von Hofe explained to me that this was a very expensive procedure that can cost as much as half a million per patient per year. I asked him if it would be more effective, and he replied that it would probably work better on solid tumors than for leukemias and lymphomas, where CAR T has been “amazingly” successful. For in-depth investors, I recommend that they look for the October 2011 issue of Scientific America and Eric von Hofe’s article there entitled “A New Ally Against Cancer.” I would create a link, but Scientific America insists, perhaps rightfully so, that you must have a subscription. In the article, von Hofe gives a history of cancer and immune response, and brings it from the 19th century all the way up to the date of the article. Harold Haines, Ph.D. Tulane University, resides in the Miami area; President, NuGenerex Diagnostics, Inc.
Hal is a long time Floridian with the bruises to go with it. He lost a house to Hurricane Andrew in 1992 and lost part of house and a roof to Katrina before she made her way over to New Orleans. Hal came with Hema Diagnostics, which is now re-named NuGenerex Diagnostics (NDG). He was consulting for it before taking over its management. The idea was to make tests that could yield results while the patient is still in the office, or while the nurse is in the room with the patient, and thus initiate or modulate treatment in a more timely way. Tests have already been developed for: HIV, Hepatitis-B, Hepatitis-C, and Malaria. A test for syphilis is before the European Union awaiting the CE mark of authorization. This could be a real seller because syphilis is staging a comeback. Interestingly, it has become prevalent in the retirement homes. This test could be the first real money-maker for NGD. “Most of our tests are qualitative. They tell you if someone has a disease or not, but in sepsis we will be able to tell whether the condition is increasing or decreasing.” He explained there is a real need for such a test because it is hard to diagnose, and a patient can die in 48 to 72 hours. You can expect deal-making (witness the deals of the last few days at the end of this piece). You can expect Joe to pick up some new technologies, and to expand the pharmacy-medical services business. You can expect that some of these technologies to be great, but others to be a drag on earnings. Expect ups and downs. I feel Generex might be like Cisco, which grew from one acquisition to the next. It is not just the kids who want to improve our lives. James Anderson talks about 1/7th of all disease coming from diabetes. Eric von Hofe was motivated to improve cancer outcomes even when Generex went into suspended animation. Terry Thompson left Medco when he couldn’t get the lowest price for his customers and is motivated to improve opioid addiction outcomes, and to avoid waste and corruption. Hal Haines wants to detect disease as early as possible for as little as possible. And Joe Moscato has wanted to see patients benefit from all of these improvements since he first began working with the firm. And not to forget, it’s all an all-volunteer army at this point. There is no money for salaries. Maybe they will get paid something eventually. It’s not guaranteed. But working to solve big problems motivates people. Cancer vaccines are a hot area. The question is: what is a cancer vaccine company worth before the Phase III trial and FDA approval? It apparently depends on market sentiment. When the market is really hot as was the case with Juno, an untested company could be worth as much as a billion. Other times, the market can be more skeptical. Then, suddenly, a company can open its pocket book, witness the move by Bristol-Myers Squibb (BMY) in February 2018, which paid $1 billion cash and made an $850 million stock purchase from Nektar (NKTR). The Ii-key peptide technology has been tested, and it has shown good safety and efficacy. And if Generex stock were not in the Mariana Trench, the announced trials with Merck and Shenzhen might have added millions to the stock market cap, but as it is, it added nothing at all. As Jason Terrell has suggested above, new data might do the trick. But ultimately, high values are possible as the sales of Juno Therapeutics to Celgene for $9 billion and Kite Pharma to Gilead for nearly $12 billion shows. We’ll know when the market approves because the stock valuation will expand suddenly by hundreds of millions, or a billion. In the meantime, this makes Joseph Moscato’s plan of diversification into medical services – pharmacy and opioid management – looks both timely and very sensible indeed. The feelings of the leader of that initiative, Terry Thompson, will not be hurt if things suddenly improve for the cancer vaccine end of the business, as per his personal experience cited above. He will rejoice. No matter what, he will see his end of the business through to growth and profit. Let’s discuss the case of insulin. The formulation has always worked to some extent, but initially the formulations were weak, sometimes requiring as many as 20 puffs. In 2015 research had improved the formulation to the point where only 2 to 5 puffs were required, and research in dogs had established its efficacy, and again its safety. It’s my take that this good news in the improvement in potency is not built into the stock. Generex needs, of course, to test this in humans, but that requires money, and that is the current stumbling block. James Anderson thinks maybe a new study will stir up interest. What I don’t understand is that one of the big insulin players – Eli Lilly, Novo Nordisk (NVO), or Sanofi (SNY) have not ponied up to get that research completed. Do they really think needles or pens (again, a needle) are really satisfactory? Unfortunately, you cannot necessarily count on the drug companies to act in the interest of their patients. In 2017 a suit was brought by a group of diabetes patients against the big three insulin makers for collusion. If 60 Minutes were to run a story about how diabetic patients could be saved a lot of pain, and then interview doctors on how patients would be much more compliant with doctor’s recommendations, and how their outlooks would be so much better, I’m not sure even that would move the insulin makers. They would say to interviewers that the technology is not ready yet. Then I suppose the interviewers would have to be clever enough to ask a second question, why aren’t you funding such a study? And a third question: Don’t you care about the pain needles cause patients? Well, my job is not to foment a revolution; my job is to shine a light on a promising technology. But if patients can sue over collusion, they might also use their weight to let their fellow users know that the drug companies are slugs again. There is something around that could save them a lot of pain. All I know is that my diabetic neighbor downstairs has injected himself for decades, but my take is that he would change in a day if he could just puff a little insulin inside his cheek. Let’s take another tack. You’re in the insulin business. Ask yourself: what would be the best way to sell more insulin? Answer: make it painless. James Anderson says patients avoid starting insulin when they need to, sometimes by years, because of the needle. And doctors fear their patients don’t take insulin often enough, also because of the pain of the needle. Getting these patients to take insulin when they need to will reduce the medical bill for the country, but it would also sell a heck of a lot more insulin. Do good – and hopefully get something out of it. That seems to be a theme I heard throughout top management. Pfizer had an idea about the delivery of insulin, and that was through the lungs. The product they developed was called Exubera. It turned out patients and doctors were not comfortable with the continual ingestion of insulin into the lungs. Pfizer decided to discontinue the product, and wrote off $2.8 billion. But Pfizer wasn’t in it for the write-off; they were in it for a successful product. So I am valuing Ora-lyn, Generex’s product, at twice the write-off. I think they had the right idea, but the lung was the wrong target for the drug. It seems they gave up on alternative means of ingestion, even though they were on the right track. Mannkind (MNKD) had the same idea. Insulin which comes in through the lung with a product called Afrezza. There is no way to describe them (after Pfizer walked off the field) but as madly persistent. They did develop a product and got it through the FDA. They made a deal with insulin maker Sanofi for $150 million, but ultimately, they discovered what Pfizer had already found out. Patients don’t want to put stuff in their lungs, and the agreement with Sanofi was terminated on January 5, 2016. As far as I can tell, this technology should be worth hundreds of millions even as things currently stand. The idea that all information is built into the stock price is hogwash. But that can be an advantage for astute investors. Zample: those of us who invested in DSL (digital subscriber lines) technology because it would provide the bandwidth necessary for streaming video through telephone lines – we had to wait a long time. Meanwhile, we were out there chatting on the bulletin boards: What’s taking the Baby Bells so long? Then sentiment changed, the technology was adopted, and my DSL stocks started to climb. I remember one of my winners, Aware, made a ten times move. Given the architecture of the telephone business, DSL was inevitable. The inside of the cheek is rich in blood vessels. For a means of getting insulin inside the body without the pain of a needle, it’s a natural. Investors need to stay the course. Veneto was privately owned, so the acquisition is, in effect, a sort of IPO, especially given Generex’s low market cap. An IPO would produce an instant value for Veneto that might reasonably put the stock at 20 times adjusted EBITDA of $7.6 million, or $152 million. And the stock did rise very quickly in near IPO style to the $25 million level, but it still feels light, so I’m not convinced that the IPO of Veneto is over. In addition, Joseph Moscato told listeners to the conference call in December that another privately-owned pharmacy network would be added to NuGenerex Distribution Solutions (NDS), to which Veneto was the base acquisition, so the ongoing IPO of these previously untraded companies could continue for a while. And if other like businesses become available for sale at an attractive price, yet more private value might be added to this public company. Additionally, private value becomes public value for the recent acquisitions, Regentys and Olaregen. So, there is and will be a continuing on-going IPO at Generex of at least these four companies (Veneto, As-Yet-Unnamed Pharmacy, Regentys, and Olaregen). Generex is paying $35 million for Veneto, $15 million for 51% of Regentys, $12 million for 51% of Olaregen. Regentys acquired a patent on Friday (12/14/2018), and the stock jumped 24% percent. “Regentys™ Extracellular Matrix Hydrogel (“RECMH”) is a proprietary, patented UC treatment that protects damaged tissue from waste flow and promotes tissue regeneration and healing rather than suppressing the immune system as other treatments currently do.” I was intrigued by their description of the product: “The product has been developed with polymeric characteristics that transform ECMH from a liquid to gel form upon adherence to the mucosal lining of the diseased colon, providing a “Bio-Scaffold Bandage” to the affected area.” Then there were the numbers. Two million sufferers of Crohn’s Disease and other inflammatory bowel diseases, and $6 billion global market for these kinds of diseases. The company thinks it might capture a billion dollars of that market. Also purchased was Olaregen Therapeutix, which has a patented collagen-based dermal matrix which can be used in a variety of different wounds – surgical wounds, trauma wounds, diabetic ulcers, look to the link at the beginning of the paragraph for a complete description of all the uses of its product, Excellagen. The list is extensive. Generex believes this product together with its product in development, Excellasome, for the regeneration bones, joints and cartilage, could also reach a billion dollars. Circling back to Veneto, Generex is developing an MSO (medical services organization) network of doctors, offices, pharmacies, patients. And this network will give them faster than normal access to patients who can use – not just opioids, and other drug products, but CBD products (partnership with Puration), their new products – Excellagen for wounds, and their “scaffold bandage” for use in the intestinal tract, but also for all manner of other services mentioned above. So, the network will pay dividends as it can refer patients of MSO to its other products and services. So, there is an urgency to get the MSO network setup. Terry Thompson is the uniquely qualified to pull off this sweep into new territory with his experience at Medco. Generex thinks that it will add $5 million of revenue for each state it adds to its network, and it is looking to go into an additional 22 states. No timetable has been given for when these states will be added, but I think it is reasonable to assume that all states will be reached within three years’ time. Looking at the pitfalls, in the case of the vaccines, I read 25 years ago about a trial where scientists were able to resolve brain cancer in mice 21 out of 21 times. I thought: this is not chance. I think this must have been before the internet, and I cannot find this article anymore. But as I recall, my research led me to Immune Response Corporation, a company founded or co-founded by Jonas Salk. A lot of Ph.D.’s on staff. Salk had developed a vaccine for HIV called Remune. Eventually, funds ran out. They, too, were on a mission. They had a peptide vaccine for rheumatoid arthritis, psoriasis, and multiple sclerosis. They had gene therapy for lowering cholesterol, hemophilia, hepatitis C. They, too, wanted to change the world. In trying to find out what became of them for this article, I looked up their website, I got the message that the domain may be for sale. I had sold my shares for peanuts years ago. And the Bristol-Myers Squibb collaboration with Nektar mentioned above is looking a little iffy after new data came in, though more data is needed to clarify effectiveness. Buccal delivery. The non-inferiority tests required by the FDA can be devastating. I owned shares in a blood substitute maker Northfield Laboratories. It had to show that its product performed no less well than blood or blood plasma. It performed pretty well, but not quite as well as blood or blood plasma. The company’s shares fell precipitously, and in 2009 it was liquidated under Chapter 11. Generex is under a similar non-inferiority burden, though it is not a test of insulin. Insulin is insulin. The body makes it. No, it was a test of how well the insulin gets into the blood stream as compared with a needle. And the formula has been improved since its Phase III of 2011. As regards the Veneto acquisition, the owners accepted a promissory note from Generex. In January, that has to be replaced by cash (or perhaps another note). I put it to Moscato, and he did not think it was an insurmountable problem, and he has raised millions for Generex research. But the financials are not a pretty sight. There’s nothing there. A paltry $700,000 payment by Shenzhen Bioscien is all the income the 10K shows. “Stockholder’s Deficiency” sheds light on the losses that have plagued the company. There is, of course, a “Going Concern” note. This is not a company for the faint of heart. Next year, assuming Generex makes it past all of its payment schedule hurdles, (a sampling from the 8-K’s are Regentys and Olaregen), which is not a given considering what’s in the kitty, the 10K will look very different with the recent purchase of Veneto, and these other acquisitions. But if I haven’t given you pause, I have not succeeded. I should have given you pause. Let’s just get it out in the open. This is not Merck or Pfizer. If you want Merck or Pfizer safety buy Merck or Pfizer. This is riskier. On the other hand, there is also a downside to Merck and Pfizer. I have in mind a longish piece about the granddaddy’s, the huge companies. It will begin with a discussion of U.S. Steel. It was, in effect, the steel trust. In 1901 J.P. Morgan had bought Andrew Carnegie’s steel company for $480 million, plus ten other steel companies. It had capital of $1.4 billion, the largest company in the world with 67% percent of the domestic steel market. But get this: ten years later, they were down to 50%, and a hundred years later, they have around 10% of the market. It’s the safety of slow death. Speaking of huge, it turns out that Big Pharma is only so-so at research by its own scientists. Per the Fortune article, “Inside Pfizer’s Palace Coup,” Pfizer spent $60 billion on research 2000-2008, and that only resulted in nine drugs. It seems to me, the big job of Big Pharma is to recognize where the good work is being done by the research start-ups and buy those companies or partner up and fund their research. It may very well determine the success of those granddaddies. To summon up Bob Dylan, if you aren’t busy being born, you are busy dying. So, you may wish to have a few fresh faces in the mix. But buy no more than you can afford to lose, this is high risk. A sliver. As my father would say, ten cents worth. Buy a little now, and watch the announcements, if you see something really significant, like a partner for the buccal technology, or positive Phase II results for the cancer vaccines, or other new partners for the cancer vaccines, increase your stake. I figure Generex has three (3) chances to achieve a market cap of $1 billion in five years. One – is the buccal delivery business, of which insulin is the test case. It would be worth at least a billion. 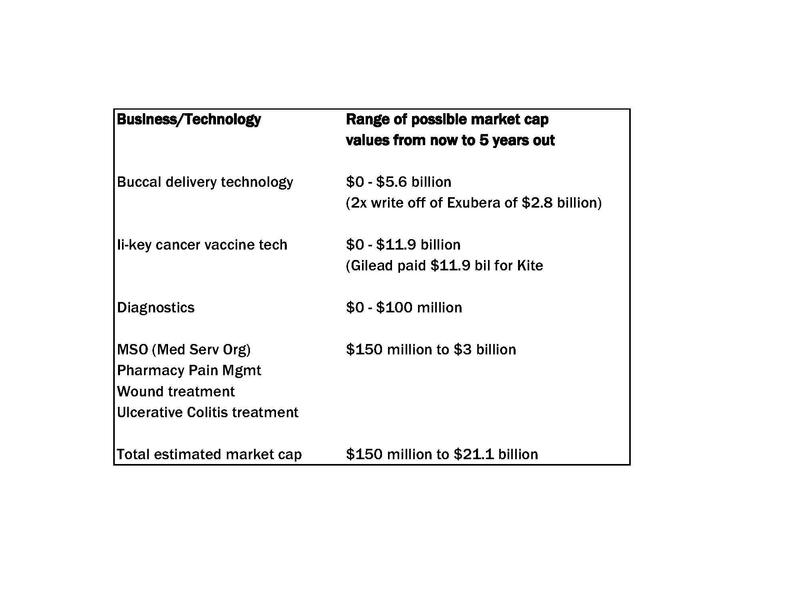 Two – is the Ii-key peptide vaccines, which are being tested on breast cancer and prostate cancer, and where Jason showed me that Juno and Kite achieved billion dollar valuations even before their cancer vaccines proved out. (Think of the stock market reaction to a successful Phase II now that Generex is awake). And three, the MSO/pharmacy business (plus newly purchased treatments) is being programmed for rapid growth of a kind that may well result in a billion dollar sales in five years all by itself. I only need one of these three to succeed to hit my target. For now, I am assigning a market cap of $150 million to NuGenerex Distribution Solutions (NDS), which holds Veneto. We were told in the conference call that Veneto will likely generate millions of EBITDA, and they paid a little over four times adjusted EBITDA, or $35 million. If you assign a multiplier of 20, you get $152 million. But the new entity NDS also includes the new acquisitions, Regentys and Olaregen, the Puration (OTCPK:PURA) deal, and an as yet unnamed pharmacy which has been conducting audits prior to inclusion. I have no way to assign numbers to these things. $150 million is a minimum figure. Another way to look at it is this: one to two times sales for the MSO/pharmacy unit (Veneto and including the unnamed pharmacy conducting audits) plus contributions from the Hema diagnostic products (if any), the new Regentys ulcerative colitis treatment (if any) and Olaregen wound treatment (if any), and that still does not assign any value to buccal and cancer vaccines. The cancer vaccines look promising, but I cannot put anything into the equation for that because the market is resistant. We have to wait for more data. But if insulin users are to avoid the pain of a needle, then the buccal treatment (since the lung method has been rejected by consumers twice) will likely become the standard delivery method for insulin. Given the hundreds of millions that have been spent on testing for that (even if badly invested in a poorly designed trial), no one was harmed, and now the formula has been amped up, if the market changed its viewpoint about that technology and unmet need, I’m okay with multiple times the $150 million. All said and done, I don’t believe it will ever be possible for me to deliver more alpha to investors than I will with this piece. (To refresh – the excess return of an investment relative to the return of a benchmark index is an investment’s alpha.) In part, this is because the value of Generex’s technologies drifted to ridiculously low values, and even after the recent run-up, still remains remarkably low. And in part it is because prospects of these businesses, the two they have had for years, plus the new businesses, appears to be remarkably good. As I have stated above, I’m setting a five year market cap target of $1 billion. Serious investors should read the conference call transcript. Press releases and other pertinent links and information can be found at Generex’s investor site. Also, Generex had only a little over 1 million shares outstanding after the 1-for-1,000 reverse split. The company decided that was too few shares, so to increase the number of shares outstanding and they paid a stock dividend to shareholders in November of twenty (20) shares for every one (1) share owned. Disclosure: I am/we are long GNBT. I wrote this article myself, and it expresses my own opinions. I am not receiving compensation for it. I have no business relationship with any company whose stock is mentioned in this article. Additional disclosure: I have owned shares of Generex continuously since 2008. I first spoke with CEO Joseph Moscato in 2010 at which time he was not an employee or board member of the company, but contracted as a consultant to help raise funds and seek out opportunities for them. I again contacted him after he became the CEO in 2017, and met with him in April and November of 2018. This article results from those meetings and from telephone interviews with the key officers – James Anderson, Eric von Hofe, Jason Terrell, Terry Thompson, and Harold Haines.